Abigail Quandt and Adam Gacek examine Koran, originally uploaded by Walters Art Museum Illuminated Manuscripts. Adam Gacek catalogues our Islamic manuscripts remotely, using a web based cataloguing tool designed by Doug Emery of Emery IT especially for the purpose. But he does make periodic vists to the Walters to Study the actual manuscripts. 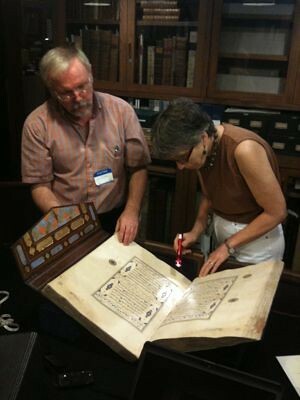 here he is studying a Koran with Abigail Quandt, Senior Conservator of Manuscripts and Rare Books at The Walters.